Irma Amatin (left) and Tairon Usaro tie the knot in front of priest Charles White at EVE Fanfest 2018 in Reykjavik, iceland. 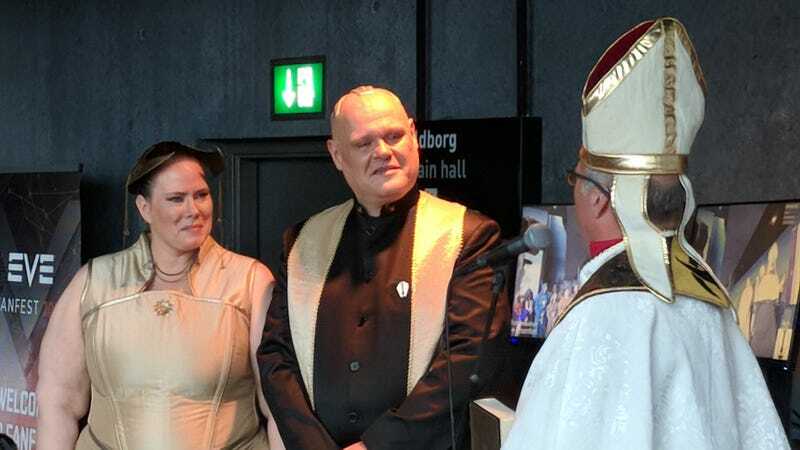 Last week, two EVE Online players chose to share their life’s happiest moments with the community at EVE Fanfest in Reykjavik, Iceland, where they were joined in holy matrimony by the Space Pope. Tairon Usaro and Irma Amatin, dressed in formal Amaarian cosplay, tied the knot on stage during the Fanfest livestream. The couple met for the first time five years ago, shortly before Tairon was scheduled to fly out to a different Fanfest event, and all through his trip that year he was unable to focus on spaceships. His thoughts kept drifting back home to Germany where he had left the woman who was destined to become his wife. All through the event Tairon shared pictures and stories of EVE and the people he was meeting with Irma, who as a non-player was admittedly more than a little confused at the spectacle. Luckily for Tairon, Irma’s interest in him allowed her to look past what many might consider a non-traditional courtship. Once Tairon returned to Germany, the two quickly began a relationship that would end up drawing Irma into the strange and wondrous world of EVE Online. As the two of them grew together as a couple, their involvement in the community surrounding the game became more and more involved. Together they formed and run the largest German-language player meetup group, G-Fleet. G-Fleet is an annual meetup in Dusseldorf, Germany, thought they will soon be moving to Berlin, which plays host to nearly 200 EVE Online players brought together by their love of the game. During the closing ceremony of last year’s G-Fleet Meetup, after leading the group in their traditional song, Killing is a Means of Communication, Tairon stopped the ceremony, turned to Irma, and proposed to Irma in front of the cheering crowd. “We were engaged as part of the community, and we felt it was appropriate to share the wedding as well,” Irma said. The couple admitted that they had actually had a very private official ceremony a few months ago, but wanted to involve their role-playing group at Fanfest, as well as the semi-official religious icon of the EVE world, Max Singularity, AKA the Space Pope. Charles White—aka His Holiness Max Singularity, aka the Space Pope—is an EVE Online player, a NASA scientist, and an ordained priest. His Holiness Max Singularity, Space Pope of EVE, is a widely recognized figure at EVE Meets. In his other life, he’s Charles White, a knowledge management specialist for the NASA Jet Propulsion Laboratory. He’s also an ordained priest through the Universal Life Church. In front of his adoring flock, all dressed in cosplay attire based on EVE Amarr empire, White performed the ceremony, projected out over the Fanfest crowd. Cheers went up throughout the crowd as the couple shared their first kiss as a married couple—well, with the marriage officially recognized by the Space Pope, anyway. As everyone cheered the happy couple moved off stage and went to enjoy themselves and relax after sharing a special moment with the guests at Fanfest, and everyone watching the livestream at home.